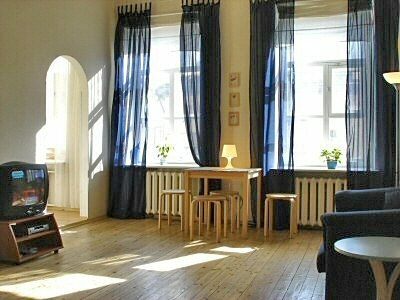 Newly renovated beautiful apartment, close to Kazansky Cathedral. The apartment features a large living room, two bedrooms with queen size beds, a kitchen, and a hall with storage closet. It is located on the 3rd floor, no elevator. The entrance to the apartment block is from the yard through a coded building door. Parking is available on the street and in the yard. The apartment sleeps up to 6 guests (two queen size beds in the bedrooms, and a comfortable double sofa-bed in the living room). Amenities include television, satellite TV, stereo radio deck, telephone, refrigerator, stove, electric tea kettle, kitchen utensils, washing and drying machines. The apartment has linens, towels, bath amenities and cleaning supplies. Conveniently located within short distance to Nevsky Prospect and Kazansky Cathedral. The nearest metro station "Nevsky Prospekt" is within 5-minute walk. Close to cafes, restaurants, bistros, business centers, internet-cafes, great shopping, and all the entertainment Nevsky prospect has to offer.